Black Panther and its cast led the group with seven nominations for the night, including Best Movie, Best Performance In A Movie, Best Hero, Best Villain, Best On-Screen Team, Scene Stealer, and Best Fight. 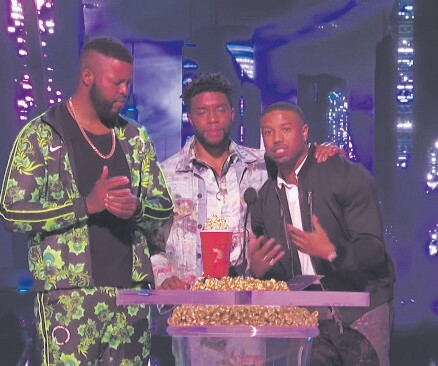 The cast took home the first four awards with Chadwick Boseman taking home both Best Performance and Best Hero and Michael B. Jordan taking home Best Villain. The Stranger Things cast was not far behind in nominations with six total for the night. They took home three Golden Popcorns with the cast winning Best Show, Millie Bobby Brown taking home Best Performance In Show, and Noah Schnapp winning Most Frightened Performance. This is the second year in a row that the MTV Awards has experimented with genderless categories, foregoing former categories for Best Actor and Actress for Best Performance categories in television shows and movies. For the full list of winners, visit www.mtv.com/news/3079939. Balck panther is pretty cool movie to watch. All HD movies and TV shows are available for free on this app.